The Rhine hymned by women’s voices. A major source of inspiration for writers and painters (Hugo, Nerval, Heine, Eichendorff, Turner) and above all composers throughout Romantic Europe, the legends of the Rhine still enthral our imaginations even today. The Ensemble Pygmalion and Raphaël Pichon invite us on a fantastic voyage through famous works (including Wagner) and others, much more rarely recorded, that are absolute gems of the repertory for female voices. Transcriptions and original compositions for female chorus and a section of historical French horns are poured into an evocative, eclectic narrative of six chapters about “Rhinemaidens” on this release. Where there are girls and horns (no wabbits), Wagner can’t be far behind and so a version of Wagner’s Rheingold overture for 24 female voices, harp, horn-quartet, and bass opens proceedings. We meander through the heartland of German romantic music — Schumann, Brahms, Schubert — sometimes acapella, sometimes via horn quartet, or solo. There’s a delicious cameo by Bernarda Fink in Schubert’s Ständchen (his version for mezzo, female chorus and harp). It’s altogether sunny and transfixing and novel and really everything a CD recital should be. The Rhine Maidens are the sisters who cavort in myth-laden currents to get the action moving in Wagner’s Ring cycle — and then return at the end as everything that has happened gets washed away by those same waters. Throughout centuries, the Rhine has been a central metaphor for Germans, and it informs a number of the selections on this delicious album of songs for women’s choir from 19th-century Germany. It was a favorite medium at the time, and many of the greatest mainstream composers wrote works for such ensembles. The repertoire reaches its summit in Brahms’ Four Songs (Op. 17) for women’s choir, two horns, and harp, which shines here in a gripping interpretation. The Bordeaux-based Ensemble Pygmalion, directed by Raphaël Pichon, specializes in historically informed performance, and the timbre of period horns makes a telling difference here compared to other recorded readings. That set is nearly rivaled by Schubert’s famous Ständchen, for women’s choir and solo mezzo-soprano (here Bernarda Fink). Works by Schubert and Schumann take turns in the playlist, along with other selections by Brahms, mostly “as written” but sometimes in winning adaptations, as in a Brahms song about horns that here is actually recast for horn quartet. Pichon includes some interesting but rarely heard canons by these composers, and Wagner’s Rhine Maidens make two appearances to wrap the whole thing in their gauzy veils. Ensemble Pygmalion‘s new release on Harmonia Mundi, Rheinmädchen, is a sort of concept album on the theme of the Rhinemaidens and other German legends. A mix of music by Schubert, Schumann, Brahms, and Wagner, much of it choral, it weaves the disparate composers’ visions together by juxtaposing works that relate to German mythology and are also linked by the ancient tradition of the canon. The album begins with the dark grandeur of Wagner’s “Auf dem Grunde des Rheines.” But while Wagner may have been the avatar of the 19th-century revival of Teutonic mythology, Raphaël Pichon’s ensemble places the composer in context in an innovative way. The program progresses in mini-suites that create enlightening dialogue among the composers. For example, Brahms’s tiny, intense canon for female voices “Wille, wille will der Mann ist kommen!” is sandwiched between the “Horn Call” from Wagner’s opera Siegfried and Schubert’s “Ständchen” for mezzo-soprano, women’s choir, and harp. The voices sound live and echoey, as if heard in a large church. The effect becomes haunting in works like Schubert’s canon “Lacrimosa son io” (part of a “Mourning Women” suite) and two selections from Brahms’s 13 Canons for Women’s Voices opus 113. Along the way there’s a good deal of impressive instrumental work, including on the difficult-to-play natural (valveless) horns of the period. Hunting calls and harp arpeggios echo from one piece to another, suggesting surprising affinities between, for example, Wagner’s triumphalism and Brahms’s romanticism. Given its program, the album can’t sound like a contiguous whole, but it certainly can please the ear and engage the brain. A Rhine Journey in the Company of Rhine Maidens. Rivers tend to be men, but Father Rhine only had daughters to entertain him in his dotage. Those women are summoned up in this amorphous album delivered by the female singers of Ensemble Pygmalion, four horns and a harp. It’s a bold attempt to put the phallic symbols of German Romanticism – thrusting symphonies, macho concertos – to one side and explore a softer, damper type of mood music by Wagner, Brahms, Schubert and Schumann. If there is a feminist slant here, the point isn’t laboured. The musicians are actually co ed: the harpist is a man (Emmanuel Ceysson, who describes himself as ‘the enfant terrible of his instrument’, a position for which there must be few applicants), and so are three of the hornists and the conductor, Pygmalion’s Raphael Pichon. ‘Rhinemaidens’ is apparently the first of three Pygmalion albums which will gradually move forwards in musical history; the second will explore male voices and the third feature mixed voices. Also saving the album from being a literal damp squib is the other major leitmotif. Canons run through nearly all the pieces, reinforcing ideas of flow – fluvial or otherwise – and development. These begin, appropriately, right at the bottom of the Rhine, in the Prelude to Das Rheingold, the horns’ elemental calls buttressed by growling double basses, the wordless cries of the singers building to a shimmering climax. Wagner’s Ring returns in Siegfried’s Horn Call and his Funeral March, orchestrated for four horns (bouncily done, but a bit Bridlington bandstand rather than funeral pyre in Westphalia), and finally the Rhinemaidens’ lament from Götterdämmerung. Yet those are really atmospheric waymarks to guide you through rarer treasures by the other three composers. Siegfried’s horn doesn’t summon a slobbery dragon but Brahms’s folksong (in canon, of course) ‘Wille, wille will der Mann ist kommen!’, followed by Schubert’s ‘Ständchen’ for female chorus, harp and mezzo-soprano (Bernarda Fink), a real Biedermeier house-party extravaganza. In a section inspired by mourning, the Rhine’s waters dissolve into the tears of Schubert’s stark ‘Lacrimosa son io’, Schumann’s double canon ‘Die Capelle’, immaculately delivered, and back to Schubert for the remarkable ‘Coronach’, a keening lament to words by Walter Scott. With the voices now accompanied by declamatory horns and harp, the ballad has an authentically Gaelic feel without succumbing to new-age whimsy. Indeed, it’s the discipline of the delivery – whether it’s the firm, resonant voices or punchy horns – that impresses most here. Both passionate and precise about their subject matter, Pygmalion have discovered watery depths to familiar composers, and have certainly not sold us down the river. Raphaël Pichon (b.1984) founded the French choir and original instrument ensemble Pygmalion in 2006, since when he and they have clearly gone from strength to strength. They have made several acclaimed records of Baroque repertory, two of which, featuring music by Bach and Rameau, have been welcomed by MusicWeb International. However, they are plainly keen not to limit themselves to ‘early music’: the booklet accompanying the disc under review tells us that “this programme is the first part of what will be a trilogy devoted to the role of canon in German musical history. After the feminine expression of the Rhinemaidens will come a selection of music for male voices from the turn of the twentieth century, before a final programme of works for mixed voices by Strauss, Schoenberg and Webern”. The unifying thread of this first instalment of the trilogy is, then, alongside its demonstration of the pervasiveness of canon form in German Romanticism, the idea of the Rhine and, particularly, of its ‘maidens’ – be they sirens, nymphs, sprites or whatever. There were many German composers, as the booklet goes on to remind us, who “drank at the well” of this tradition. And “it is this reality that Raphaël Pichon and his Ensemble Pygmalion have sought to illustrate by inviting us to follow the course of the Rhine in the company of his ‘maidens’. Drawing on the German imaginative heritage, they present a programme in a number of tableaux in which these great composers of German Romanticism are as it were intertwined on the thread of tradition, bearing the song of the Rhinemaidens in all its mystery and enchantment”. This project clearly does not lack anything in imagination, creativity or indeed ambition. In essence what we have here is a sequence of twenty pieces by four greats of Austro-German Romanticism, several of which will be unfamiliar to the majority of listeners, and others of which are presented in strikingly innovative ways. The opening performance of the beginning of Das Rheingold in an arrangement for 24 women’s voices, harp, four horns and two double-basses is a case in point – and very effective it is. This is the only item in which the full complement of performers appears, though all bar three feature women’s voices, and two of the horn players and the harpist re-appear at regular intervals – the latter sometimes taking on an accompanying role that would otherwise be played by the piano. Bernarda Fink, regrettably, appears only once, in a performance of Schubert’s Ständchen which stands out not least for the intimate and mutually responsive relationship it reveals between her and her ‘backing’ singers. All in all, I suspect this issue is likely to polarize opinion. Certainly there are aspects of it that are not difficult to dislike. My quotations from the booklet have perhaps already implied that there is about the project a faint whiff of pretentiousness, and also of fussiness – a feature which comes to the fore in certain of the arrangements, such as that of Heinrich Isaac’s Innsbruck, ich muss dich lassen, which is here deprived, to me fatally, of its sublime simplicity. The link between several of the pieces and the Rhine, let alone its ‘maidens’, is also far from clear. One is several times tempted to ask questions such ‘what exactly is Isaac doing here?’, or ‘how on earth does Schubert’s setting of Psalm 23 end up in a disc devoted to sirens?’. Similarly, the division of the twenty-one tracks into six “tableaux” – in the booklet’s English translation The Daughters of Morpheus, Mermaids, Serenade, The Mourning Women, Love’s Grief is Monotonous and Rhinemaidens – does seem rather artificial, and forces several items into a mould that they don’t altogether fit. Quite what links the Rheingold prelude, Schumann’s Wiegenlied and an instrumental arrangement of Brahms’s Ich schwing mein Horn ins Jammertal (written originally for a male choir), for example, really isn’t clear. By contrast, the only one of the six tableaux whose items have a clear thematic as well as musical link works very well. I am thinking here of The Mourning Women, which presents Schubert’s canon Lacrimosa son’ io, Schumann’s romance Die Capelle, and what amounts to two funeral marches: Schubert’s Scott setting Coronach and Siegfried’s Trauermarsch from Götterdämmerung. Rather than the rather tighter programmatic coherence one might have wished for, much of the disc has, instead, a consistency of tone which can at time gives rise to a certain sense of monotony. Inevitably, perhaps, given the nature of the repertory, a good deal of the music is slow, gentle, sometimes seductive, sometimes verging on the saccharine. The horns do their best do inject an element of drama and excitement to the proceedings; but their interventions are too infrequent to redress the balance. For reasons such as these, then, some listeners will probably resist this disc’s charms. To do that would be a shame, though, since it also has plenty of plus points. For one thing, if you can forget, or at least relegate to the back of your mind, the conceit of the Rhine and its maidens, you may well find that, as a potted history of the use of canon form by German romantics, the disc works very well. It had never occurred to me before, for example, how much of Wagner’s music for the Rhinemaidens is essentially a series of canons, or how deeply the music, especially Schubert’s, is shot through with the device. The disc’s concentration on the canon is no doubt also the reason why we encounter several delightful rarities. I can’t remember the last time, for example, I heard any of Brahms’s Thirteen Canons, Op.113, or indeed Schubert’s Lacrimosa – which emerges here as a mini-masterpiece of the first order. As, for that matter, do Schumann’s Meerfey and In Meeres Mitten, settings of poems by Eichendorff and Rückert respectively, which are dark and disturbing, but also exquisitely crafted and very moving. Moreover, the performances themselves are of high quality: the instrumentalists are beyond reproach, Fink is good, and Pygmalion’s female singers are in most respects exemplary, particularly in the matter of intonation. I do wish their words were clearer; but I suppose that even this feature, combined with the resonant acoustic of the ecclesiastical recording venue, could help the disc to cast a seductively atmospheric spell which, for some listeners, would outweigh any sense of monotony or reservations about details. In the end, then, this probably is a Marmite disc. If you are the kind of listener who can buy in wholeheartedly to the disc’s concept, trust it and allow its many beauties to waft over you – and at times also stimulate your mind –, you will probably love it. If, though, your tendency is to analyse, to ask uncomfortable questions and worry about issues of coherence and structure, you might well end up frustrated and confused. Unfortunately, though, you might also be the poorer for having missed out on some rare and high-quality choral pieces that you might otherwise not get to hear. 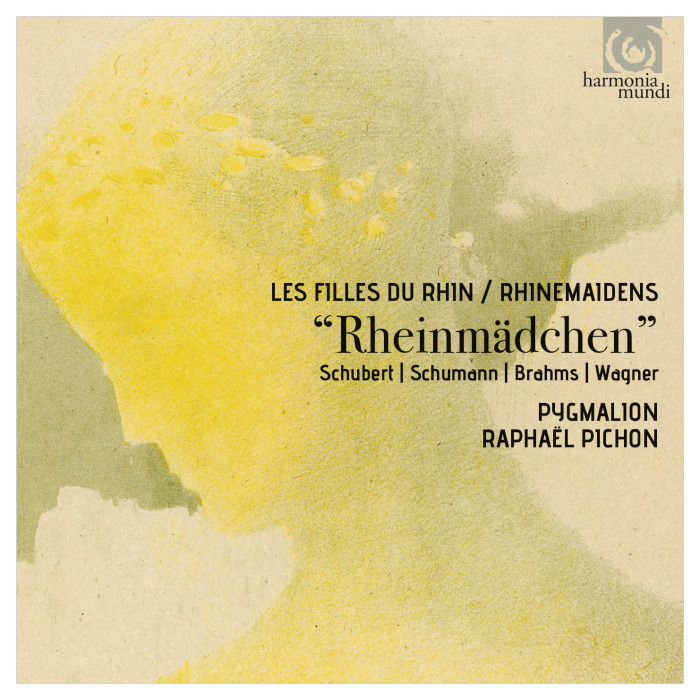 This charming new disc Rhinemaidens on Harmonia Mundifrom Raphael Pichon and Ensemble Pygmalion takes us on a metaphorical journey down the Rhine. Essentially the disc is a solution to the problem, what to programme with Brahms' Vier gesänge Op. 17 for women's voices, two horns and harp and so we have arrangements from Wagner's Ring Cycle, and songs by Schumann, Brahms, and Schubert as well as something after Heinrich Isaac. The performers are the women;s choir from Ensemble Pygmalion, conducted by Raphael Pichon with horn players Anneke Scott, Joseph Walters, Olivier Picon and Chris Larkin and harpists Marie-Amelie Clement and Yann Dubost. The horn players use period, late 19th century instruments with Brahms' requested natural horns in the Vier gesänge Op. 17. We start with Vincent Manac'h's Auf dem Grunde des Rheines for women's voices, harp, four horns and two double basses adapting the opening of Wagner's Das Rheingold with the women's voices singing the instrumental parts wordlessly to create a striking and rather magical effect. The programme is arranged in roughly thematic sections, Morpheus' Daughters, Mermaids, Serenade, The Mourning Women, Love's grief is monotonous and Rhinemaidens with transcriptions from The Ring dotted about, including a striking version of Siegfried's Funeral March for four horns, and the Rhinemaiden's music from Gotterdammerung for women's voices, two horns and harp in a completely magical transcription by Vincent Manac'h. Not every piece is strictly Rhine based, I am not clear how Schubert's Ständchen fits in, here in its version for mezzo-soprano solo (Bernada Fink) and women's chorus with a harp standing in the for piano. And the same composers Lacrimosa seems similarly at odds, though it is quite stunning. In fact the presence of the Lacrimosa indicates another interest in the programming. Weaving their way through the Rhine are a selection of pieces all based on canons, as Pichon and Ensemble Pygmalion explore how different composers have used the canon. It all sounds an indigestible mix and it could have been. But the whole is done with superb charm, and the performances are stunning in their beauty and sympathy. The choir of 24 women sings with a lovely clarity and beauty of tone, making every item a joy to listen to. And having the period horns adds to the joy. In the Brahms Vier gesänge we get the sound of the natural horn which Brahms imagined, and this adds invaluably to the sound world and these songs make a suitable climax to the programme. The performances of the songs are magically evocative with a fine-grained blend from the choir blending with the colours of the horns and harp. The performances reveal the Brahms songs to be little gems. Ensemble Pygmalion is one of a good number of France’s period ensembles, which are now, counting from Les Arts Flo, three generations strong. Its founder and conductor Raphael Pichon (YOB: 1984) is one of those non-dogmatic HIP conductors interested in Bach as much as contemporary music, in Mozart as much as the Romantic chamber choir rep. And while a lot of us who respect the HIP school of thought and its instrumental colours place its outer limes somewhere in between the early Romantics and the ripe ol’ Romantics (cause nobody wants Wagner and Mahler on period instruments), Pichon here productively blurred that distinction and very much got away with it. Schumann, Schubert, Brahms and Wagner here come together aesthetically unified as one Romantic brotherhood. Aside the all-female chamber choir, the instrumental forces begin and end with four natural horns, one harp and two double basses. It’s easy to find in Brahms’ toolbox the gossamer and the chamber-music intimate—he wrote a lot for the chamber choir—but toning Wagner down to the chamber-music level must have been a more challenging task. There’s the horn solo from Siegrfried in the first half of the program, and the funeral march for Siegfried from Götterdämmerung rearranged for four horns (arr. James Wilcox) in the second. The CD opens with “Auf dem Grunde des Rheines” from Das Rheingold, where 24 spatialized female voices stand in for the Wagnerian orchestra, together with seven aforementioned actual instruments (transcriber not credited). The Rhinemaidens return near the end, but it’ll be the Rhinemaidens of Götterdämmerung, in the transcription by Vincent Manac’h for the female choir, 2 horns and a harp. In between this Wagner, light, pulverized, almost abstract as the a capellaStrauss, a whole lot of exciting Schumann and Schubert choral rep is to be found. Much of the poetry (Rückert, Grillparzer, Uhland) is very dark—much of Romantic music is not really romantic at all, more of a tireless reminder that death and dying are always close, even when the text seems to be embarking on the topics of love and nature. Words are dark while music goes bright, intricate, enthralling. The other umbrella topic of the disc—first being the Female Figures of the Romantic Imagination—is canon as a musical form and compositional technique. Just about every included piece uses canon in some form. In Schumann’s heartrending “Meerfey” (The Mermaid), voice parts weave around as the mermaid in the text combs her hair, but by the final verse it becomes clear that it was the now-lost ship that was bounced around in the winds and waves. Same composer with “In Meeres Mitten” (In the Midst of the Sea) elevates the odd, surreal text into a wrenching expression of helplessness before the march of history. His “Die Capelle”, with its bright soaring soprano lines dancing around the less extravagant, stabilizing alto sisters, is a most cheerful reminder that thou too shalt die, careless youth. Warning: Schubert’s “Ständchen” (Serenade) is positively addictive. Bernarda Fink sings the solo part and her full-bodied, rich mezzo is an irresistible foil to the lighter and altogether more ghostly choir of voices that echo her entreaties. The text is a multi-layered delight: a collective of the unspecified voices led by the soloist mezzo-soprano come to interrupt a sleeping maiden because they love her too ardently. They consider the pros and cons of the action, then finally agree to “creep away” and let her sleep. I can’t tell you how many times I’ve listened to this thing. Is it Fink’s silky but unfragile, whole-lotta-woman yet forceful voice with just the right amount of vibrato that kills it every time? The super nimble choir that responds as one? Or the text, in which there are women on both sides, the beloved and the lover? Addiction, I tell you. There’s quite a bit of Brahms too on the disc, but for me he’s the least interesting composer of the lot. He represents with three Volkslieder in canon and concludes the disc with Vier Gesänge op.17 for female voices, 2 horns and a harp. I loved the most surprising item in there, the Volkslied for female voices op.113 No. 13, “Einförmig ist der Liebe Gram” which cheekily borrows—hey, maybe even parodies–Schubert’s Leiermann melody and turns it into a sophisticated canon while also managing to be funny. The poem by Rückert (after a Farsi text by Hafis) moans that “Love’s grief is monotonous / A Song with only one note / And whenever I heard it / I had to hum it softly”, while Brahms messes with the monotonous melody of the Leierman and un-plies its yarn into multiple constituent parts that tangle and untangle and proves that the Romantics weren’t entirely devoid of humour.